Pumpkin Mousse | What's Cooking at the Genua's? I know what you’re thinking. Pumpkin in June? Yes, pumpkin in June! It’s not just for the fall anymore! Now the big issue right now is if you can find canned pumpkin. NOT pumpkin pie filling, they are two totally different animals. For the most part I have only seen Libby’s pumpkin in a can. Small 15 ounce cans or the larger cans. During the holidays pumpkin became scarce because of the poor crop they had. The stores that did carry it started to ration it. It was crazy. I kept stocking up because I had heard from my food guru, The Hungry Girl© (www.hungry-girl.com), that the pumpkin would be hard to find. So I stocked up. And yes there is more to pumpkin than pumpkin pie! Really there is! Pumpkin is low in calories, low in fat, has no trans fat, saturated fat or cholesterol. 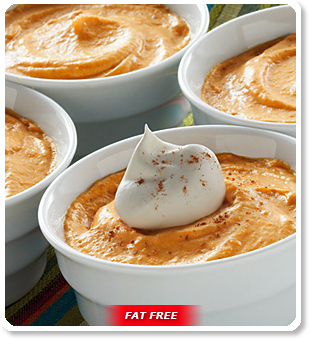 A ½ cup serving of 100% pure pumpkin equals 1 vegetable serving! It is naturally sodium free and an excellent means of getting your fiber! Pumpkin is also very high in Vitamin A with 80% as Beta-Carotene (an antioxidant) and it is naturally gluten-free! It is also a low carb veggie! So give this low-calorie dessert a spin and your body will thank you for it! I actually got this recipe from my former Weight Watchers® leader years ago. She was full of pumpkin recipes! Remember you can switch out the fat-free stuff for full fat stuff if you want. I won’t tell! 1. Make the pudding according to the directions with the 2 cups milk. Fold in other ingredients. 2. Refrigerate and serve when set! Enjoy! Dollop a little whipped topping on top and sprinkle with pumpkin pie spice if you wish!